Kilomet109 founder and head designer, Thao Vu, participated in a group art exhibition in 2015, organized by the Indochina Arts Partnership, called “YUYU Vietnam Blue”. The exhibition was held at the National Art Museum of Vietnam and included the participation of the American multi-media artist Mark Cooper and 10 Vietnamese artists. The theme of the show was to upcycle and reimagine locally sourced materials. Thao’s contribution to the exhibition was called “Sui”. Sui is both the title of the work and the major material used – the bark from a Sui tree. Sui is an endemic species to Vietnam from the mulberry family. 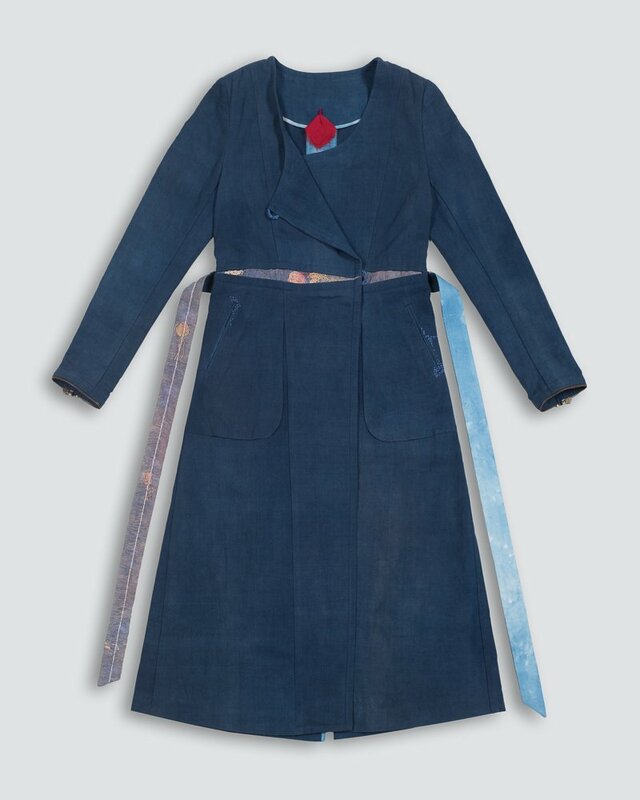 The collection consists of three main pieces that are intended for display together as an installation: the white embroidered garment made from Sui bark; the indigo garment made from hand woven cotton; and the hand spun cotton yarn waterfall. In northern Vietnam the Sui tree was traditionally used for many purposes, from dipping arrows in its poisonous sap for hunting, to pounding the bark into a pulp to make cloth. In some traditions the Sui tree is ascribed transcendental qualities. 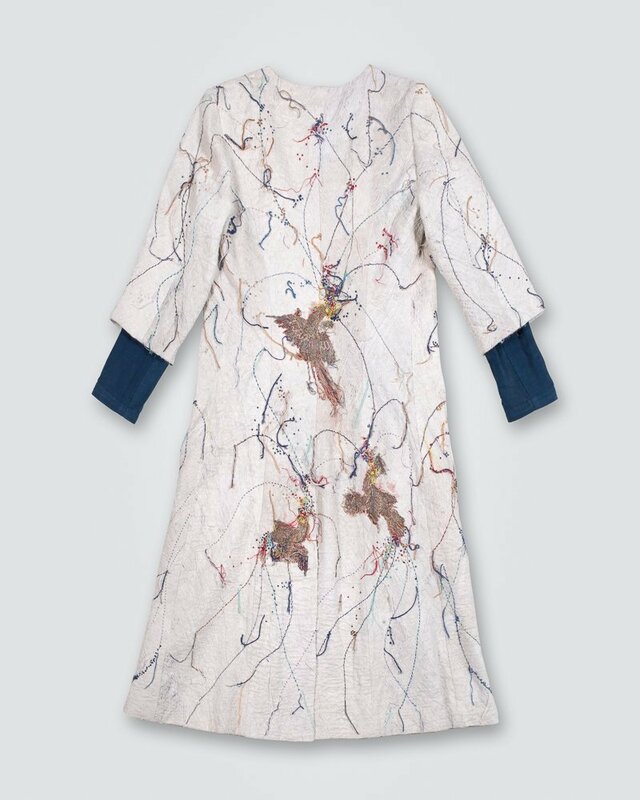 The fabric for the white garment was taken from a nineteenth century ethnic Tày blanket made from Sui bark and then transformed into a wearable art piece. In some traditions the Sui tree is ascribed transcendental properties. 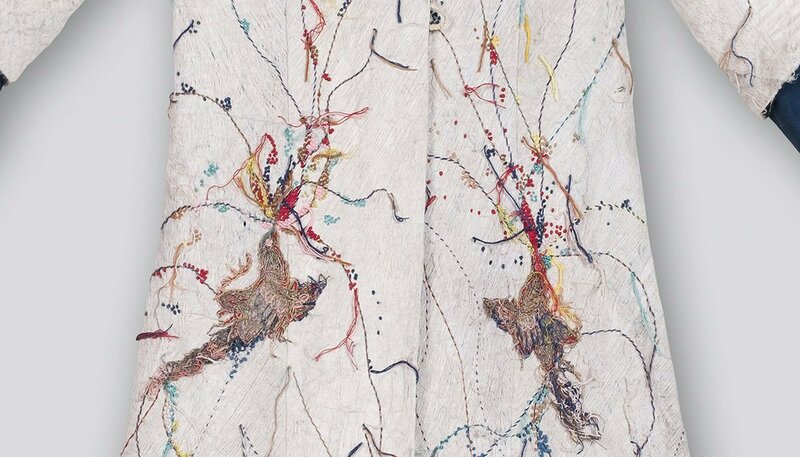 The piece combines original embroidery techniques using silver plaited thread and interwoven with bits of existing embroidery cloth to create a textured collage. The indigo woven cotton garment is intended as a more modern interpretation with its unembellished aesthetic, creating an interesting contrast with the more ornate Sui garment. Sui reflects a dialogue between the voices of Vietnam’s past and the modern world.